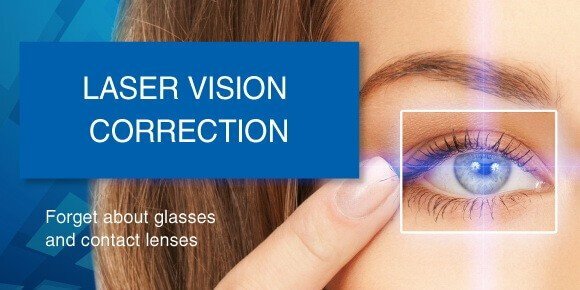 Which is the best age to go for a vison laser correction? This question is perhaps the most frequent among eye clinic patients… According to ophthalmologists the best age for an Excimer laser vision correction is between 18 and 45 years of age. Before 18 laser vision correction is not recommended as the eye (including the eye ball) is still growing and developing. Therefore refraction alterations can happen in the process. And after 45 almost everyone who had a perfect vision all the time, will develop presbyopia (age related farsightedness), this causes worse vision at short distances. The impact is such that one has difficulties recognizing small objects, reading newspapers, magazines and books… This happens because the crystalline lens becomes dencer and less elastic. Are-related changes also include weakening of muscles holding the clear lens. Brain end-lobes, responsible for vision, send signals to eye muscles but they are not yet able to adequately change the clear lens shape to focus images of near items on the retina. Presbyopia is an age-related process which cannot be stopped unfortunately. IMPORTANT NOTICE! Laser correction has no relation to presbyopia development. Whether you had a vision correction procedure or not, presbyopia will happen in most humans. They say that if a person had nearsightedness (i.e. minus) whole of his life, then with the development of farsightedness (plus) the former will be compensated leading to vision restoration. This is not true! If the impaired vision problem has not been managed, then with age you may need two pairs of spectacles: for far and near. And if you go for a laser correction you could have nearsightedness fixed, so have one problem less. But of course there are exceptions, also in age limitations. Sometimes the correction is performed before 18 and after 45. The decision though is to be taken by the ophthalmologist on the basis of a comprehensive diagnostics of the visual system.